Powder Systems Ltd, PSL, is an international manufacturer of filtration, drying and high containment solutions from small-scale production to full process systems for pharmaceutical, biopharmaceutical, chemical and laboratory industries worldwide. PSL provides advanced containment processes for the production of highly potent APIs including cytotoxic, oncology, hormones, sterile and many other active compounds. We have been established for more than 24 years and are one of the original pioneers of high containment systems. We have business operations across the world including in the USA, UK, France, Czech Republic and India; and a growing distribution network. • Our leading laboratory glass filter dryer, GFD®, technology designed for easy lab scale filtration and drying. 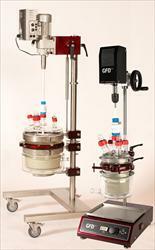 The GFD® works on a vacuum and has a heated jacket for drying. The innovative PSL removable filtration basket allows total product collection, without having to dig the cake out of the vessel. • PSL's simplefilter is a pressure / vacuum filter integrated with an agitator in option. This is a simplified alternative to more complex and costly technologies, designed for many pharmaceutical and chemical applications including: hydrogenation, carbon filtration, catalyst recovery, pre-filter for micro-filtration, APIs and intermediate filtration. • Our filtration solutions include a large range of Agitated Nutsche Filter Dryers, ANFD, which are designed to perform efficient filtration and drying of highly potent APIs and cytotoxic powder. Contained offloading is performed through an unique PSL Heel Removal Glovebox allowing complete product retrieval from the vessel. 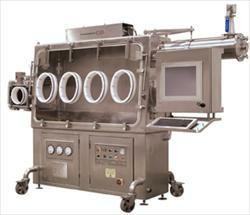 • PSL drying solutions include the leading CakeStand tray dryer. This vacuum drying oven incorporates a unique heat transfer system, generating perfect heat uniformity across all heating plates for the drying of potent powder. 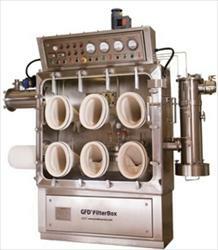 The Tray Dryer can be incorporated within a PSL glovebox isolator system. Powder Systems Ltd, PSL, containment solutions comprise a full range of glove boxes and isolators enabling users to perform numerous dangerous operations, safely. Our isolation systems provide proven containment to nanograms level for the handling of highly potent powder from laboratory and clinical trials to commercial production whilst protecting the operator, the product, and the environment. PSL's contained powder handling solutions include dispensing and sampling; charging powder in a reactor, vessel and drum filling; filtration, drying and offloading/discharging .PSL glove boxes and isolators can include interchangeable mills, micronising, sieving and blending systems in one total formulation facility. PSL now provides world leading high containment lab glass filtration and drying technology as part of their existing FilterBox range. This revolutionary technology consisting of a small agitated nutsche filter dryer (or GFD®) being completely integrated within a PSL isolator, ideal solution for small scale synthesis of highly active products. 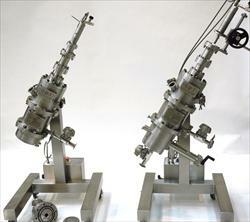 PSL starts 2013 by supporting the fast growing market of microsphere. Our process experts developed revolutionary formulation systems to produce microsphere, small spherical particles with diameters in the micrometer range. New applications for microspheres are discovered every day especially in the field of cancer research and biopharmaceutical industry. We provide solutions for lab development and scale-up.